Randolph's Leap is a chasm which a man fleeing for his life jumped across. 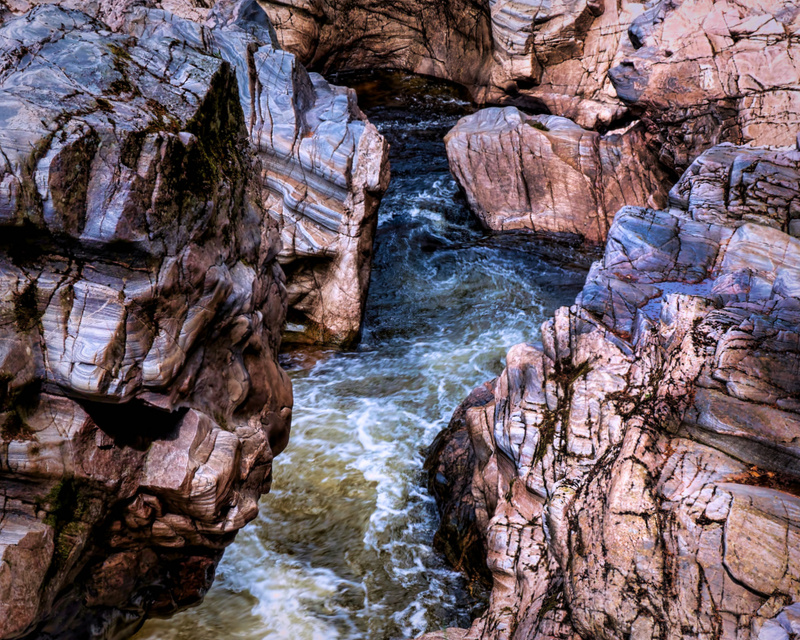 In the heartlands of Moray there is a chasm cut by the swift white waters of the River Findhorn, called Randolph’s Leap. It is an impressive sight to see, even without the backdrop of the story that played out there many centuries ago. It is a tale of feuding families, civil war, a bloody battle and the brutalities connected with the medieval siege of a castle. Set within the time frame of the Scottish Wars of Independence, it is a tale of a family in decline and the seeming rise of another family. As Robert the Bruce rose in power, he appointed his nephew, Thomas Randolph, as Earl of Moray, with the purpose of crushing his bitter rivals once and for all. 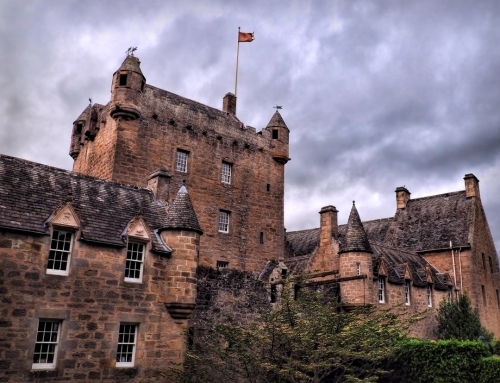 There are tales of a haunted castle in the aftermath of the events which occurred at the great forests of Darnaway, located just outside the town of Forres. In a final insult to the defeated Comyns, Randolph’s Leap is named after the Earl of Moray and not the young Comyn who jumped across the Findhorn to save his life. Who was man Randolph’s Leap was named after? Thomas Randolph, 1st Earl of Moray, was an ancient Scottish paladin who figured prominently in the Scottish Wars of Independence. The list of his accomplishments is extensive. 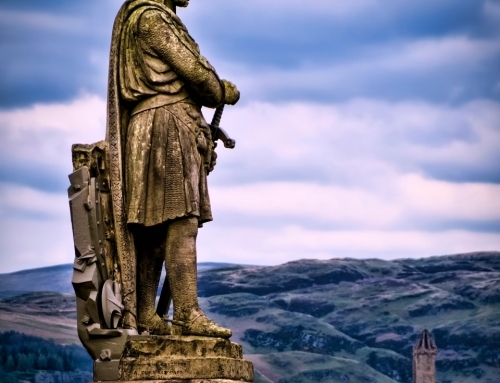 As nephew of King Robert I the Bruce of Scotland, he was a leading military commander in Robert’s successful struggle to gain independence from English rule. When Robert revolted against the English and claimed the Scottish throne in 1306, Randolph joined the insurgency, but he was soon thereafter taken prisoner at the Battle of Methven. Without the intervention of Sir Adam Gordon, the young Randolph faced the death penalty along with Bruce’s other relatives and leading supporters captured in the aftermath of the battle. He paid fealty to King Edward I of England and subsequently fought in the English army against Robert until captured by the Scottish commander Sir James Douglas in 1308. Submitting to the Bruce, Randolph quickly became a trusted commander and adviser. Robert made him Earl of Moray somewhere in the period between 1312 and 1314.By a brilliant tactical manoeuvre Moray captured Edinburgh Castle from the English in March 1314, while three months later he distinguished himself in the spectacular Scottish victory over Edward II of England at Bannockburn. Along with the Black Douglas, Moray took Berwick-upon-Tweed from the English in 1318, ravaged northern England in 1319, and defeated an English army at Byland, Yorkshire in 1322. In 1323 in his capacity of envoy, he persuaded Pope John XXII to recognize Robert’s right to the Scottish throne. Five years later he played a major role in negotiating the treaty by which England recognised Robert as King of Scots. When Robert the Bruce died in June 1329, his son and heir, David II was still a child and Randolph was appointed Regent to the child until Randolph’s death in 1332. Prior to the Scottish Wars of Independence, the great forests at Darnaway were royal hunting grounds, with the Comyns at Dunphail Castle appointed as the forest Rangers. This gave them access to bounteous hunting rights. 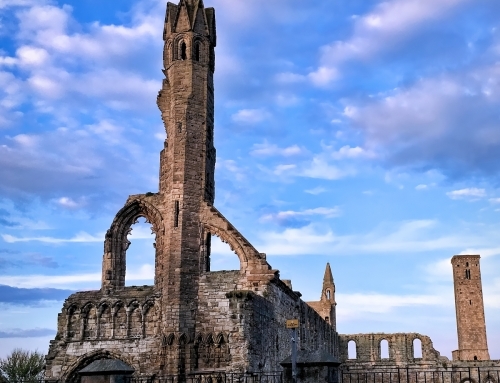 The extended family of the Comyns were Norman in origin and during the Thirteenth Century rose in power through a series of calculated marriages into the ancient Celtic families of Scotland, giving them a huge power-base in the North Eastern corner of Scotland. Then one fateful day, an argument broke out between Robert the Bruce and the Red Comyn at Greyfriar’s Kirk in Dumfries. The Comyn was left mortally wounded, plunging Scotland into a civil war between Bruce and his followers and the Comyns and their supporters. Bruce seized the crown and from that moment onward, the Comyns were in mortal danger. Gradually throughout Scotland, the Comyns were supplanted by other families. The Comyns at Dunphail met a similar fate. During the fourteenth century, Dunphail Castle was held by an old Comyn warrior, Sir Alexander, and his six sons. 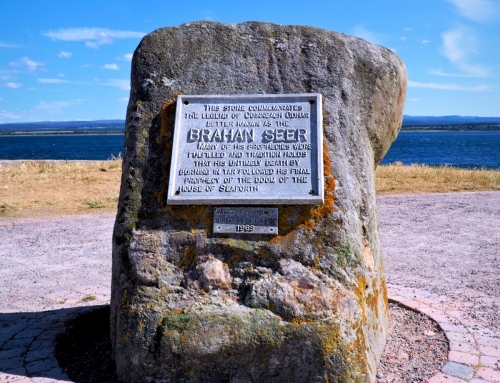 Sir Alexander had possessions on the right bank of the River Findhorn and Thomas Randolph was installed at Castlehill in Forres. Randolph had an agenda to oust his rivals the Comyns. He built a hunting lodge, now known as Darnaway Castle, right in the middle of the Comyn’s hunting grounds. Alastair Bhan Comyn: The Man ‘Randolph’s Leap’ should be named after. Alexander Comyn’s eldest son, Alastair Bhan Comyn (Alexander the Fair-haired) was a young man with a temper. One day while out hunting near Darnaway he was told by Thomas Randdolph to stay on his own side of the river. Aggrieved the young Comyn rushed it back to his father. The Comyns felt that it was an insult they could not overlook. Then an exhausted messenger arrived at Dunphail castle bearing not only the fiery cross (the call to arms) but news that another branch of the Comyn clan had been defeated at Inverlochy. By way of reprisal, a thousand strong force mustered at Cairnbar of Lethen. Under the command of young Alastair, they set out on a dark night in 1330, with the intention of setting fire to Randolph’s Lodge. Alas, Randolph heard of the attack and set up an ambush of mounted men in the gorge of the Muckleburn near Whitemire. The Comyns were thrown into confusion. The first two companies were cut to pieces. Alastair formed the rear-guard and tried to rally his men. Unfortunately, all but a few faithful followers fled. In danger of being surrounded, Alistair and four of his followers retreated to the banks of the Findhorn. With Randolph and his men in hot pursuit, Alastair and his band had little option but to jump across the chasm. They made their way up the ravine of the Divie and hid in Slaginnan Cave. They knew that Randolph and his men would arrive at Dunphail Castle before they could return. Today the chasm is named after Thomas Randolph even though he was not the one who made the momentous leap. Enraged at the tenacity of his rivals, Randolph laid siege to Dunphail Castle. Old Alexander Comyn was not provisioned for a siege, but he refused to give up. Meanwhile young Alastair became a thorn in the flesh of the Earl of Moray. From time to time he was able to throw provisions over the castle walls in spite of Randolph’s vigilance. Alastair’s final attempt to help his father was his most daring. He and his men dressed as peasants, arriving at Randolph’s camp late at night, claimed shelter as they were worn with fatigue. Overnight, they climbed an embankment overlooking the castle wall and threw in several bags of meal. Then they stole back to their cave. Randolph, enraged at being outwitted by the young Comyn, put a price on his head. According to one tale, Randolph found Alastair’s dog and used the creature to lead his men to the outlaw’s place of concealment. Once the cave was discovered, Randolph and a score of his men heaped boulders by the mouth of the cave. Brushwood was gathered, thrust into the opening and set alight. The trapped inmates rushed forward through the blinding smoke but were beaten back by the soldiers’ pikes. Alas, the merciless Earl made no reply. When the soldiers entered the cave, they found Alastair and his four men in their last sleep. Randolph’s men were commanded to cut off their heads and throw them over the castle walls. “There’s beef for your bannocks, Cummings all!” Randolph shouted. Sadly, it was not long until famine spurred the defenders of Dunphail to attempt a sortie. Alexander and his five younger sons were cut to pieces by the awaiting army. The castle was set on fire. Early in the nineteenth century the minister of Edinkillie church found the five skeletons of young Alastair and his companions buried close to the castle. The spot is still known to this day as ‘the grave of the headless Comyns’. Headless ghosts as still said to haunt the castle and there have also been reports of the sounds of fighting and groaning.